That’s just stupid. In fact, printing a back trace in gdb is as easy as writing two letters. I don’t appreciate lengthy debugging sessions that much either, but it’s something you simply cannot avoid in software development. What you can do to speed things up is to know the right tools and to be able to use them efficiently. One of them is GNU debugger. One more thing, before we proceed to gdb itself. Well, two actually. In order to get anything more than a bunch of hex addresses you need to compile your binary without stripping symbols and with debug info included. Let me explain. Reading symbols from /mnt/MyBook/code/a.out...(no debugging symbols found)...done. You can imagine, that this won’t help you very much with the debugging. Now let’s see what happens when the code is compiled with symbols, but without the debuginfo. As you can see, gdb still complains about the symbols in the beginning, but the results are much better. The program crashed when it was executing segfault() function, so we can start looking for any problems from there. Now let’s see what we get when debuginfo get’s compiled in. That’s more like it! gdb printed the exact line from the code that caused the program to crash! That means, every time you try to use gdb to get some useful directions for debugging, make sure, that you don’t strip symbols and have debuginfo available! I should point out, that in gdb, you can abbreviate most of the commands to as little as a single character. For instance r can be used for run, k for kill, c for continue and so on :). You see, that the program stopped (more precisely was killed by the kernel with a SIGSEGV signal) at line 9 of segfault.c file while it was executing a function segfault(). The segfault function was called directly from the main() function. When the program is interrupted (and compiled it with debuginfo), you can list the code directly by using the list command. It will show the precise line of code (with some context) where the program was interrupted. This can be more convenient, because you don’t have to go back into your editor and search for the place of the crash by line numbers. We know (from the stack trace), that the program has stopped at line 9. This command will show you exactly what is going on around there. Up to this point, we only interrupted the program by sending a SIGTERM to it manually. This is not very useful in practice though. In most cases, you will want the program stop at some exact place during the execution, to be able to inspect what is going on, what values do the variables have and possibly to manually step further through the program. To achieve this, you can use breakpoints. By attaching a breakpoint to a line of code, you say that you want the debugger to interrupt every time the program wants to execute the particular line and wait for your instructions. Breakpoint 2 at 0x4005c0: file segfault.c, line 8. I’m using line number to specify, where to put the break, but you can use also function name and file name. There are multiple variants of arguments to break command. To disable a break point, use disable <Num> command with the number you find in the info. When gdb stops your application, you can resume the execution manually step-by-step through the instructions. There are several commands to help you with that. You can use the step and next commands to advance to the following line of code. However, these two commands are not entirely the same. Next will ‘jump’ over function calls and run them at once. Step, on the other hand, will allow you to descend into the function and execute it line-by-line as well. When you decide you’ve had enough of stepping, use the continue command to resume the execution uninterrupted to the next break point. There are multiple things you can do during the process of stepping through a running program. You can dump values of variables using the print command, even set values to variables (using set command). And this is definitely not all. Gdb is great! It really can save a lot of time and lets you focus on the important parts of software development. Think of it the next time you try to bisect errors in the program by inappropriate debug messages :-). Well, this is new … I mean as soon as any programmer learns about functions and procedures, he knows, that it is way better to split things up into smaller reusable pieces. The thing is, this principle should be used in much broader terms. As in NEVER EVER EVER repeat any information in a software project. The key is, that it doesn’t apply only to the code. Every single time you have something stored in two places simultaneously, you can be almost certain, that it will cause pain at some point in the future of your project. It will sneak up on you from behind and hit you with a baseball bat. And then keep kicking you while you’re down. This is one of those cases in which foretelling future works damn well. Authors of The Pragmatic Programmer show this on a great example with database schemes. At one point in your project you make up a database scheme, usually on a paper. Then you store it with your project somewhere in plain text or something. The people responsible for writing code will look in the file and create database scripts for creating the database and start putting various queries in the code. What happened now? You have two definitions of the database scheme in your system. One in the text file and another as a database script. After while, the customer shows up and demands some additional functionality, that requires altering the scheme. Well, that shouldn’t be that much of a problem. You simply change the database script, alter the class that handles queries and go get some lunch. Everything works fine, but after a year or two, you might want to change the scheme a bit further. But you don’t remember a thing about the project, so you will probably want to look at the design first, to catch up. Or you hire someone new, who will look on the scheme definition. And it will be wrong. Storing something multiple times is painful for a number of reasons. First, you have to sync changes between the representations. When you change the scheme, you have to change the design too and vice versa. That’s an extra work, right? And as soon as you forget to alter both, it’s a problem. The solution to this particular problem is code generation. You can create the database definition and a very simple script, that will turn it into the database script. Here’s a wonderful illustration (by Bruno Oliveira) of how that works :). Hunt A., Thomas D.. The Pragmatic Programmer. Addison Wesley. 1999. Another great piece of computer literature I found in our campus’ library! 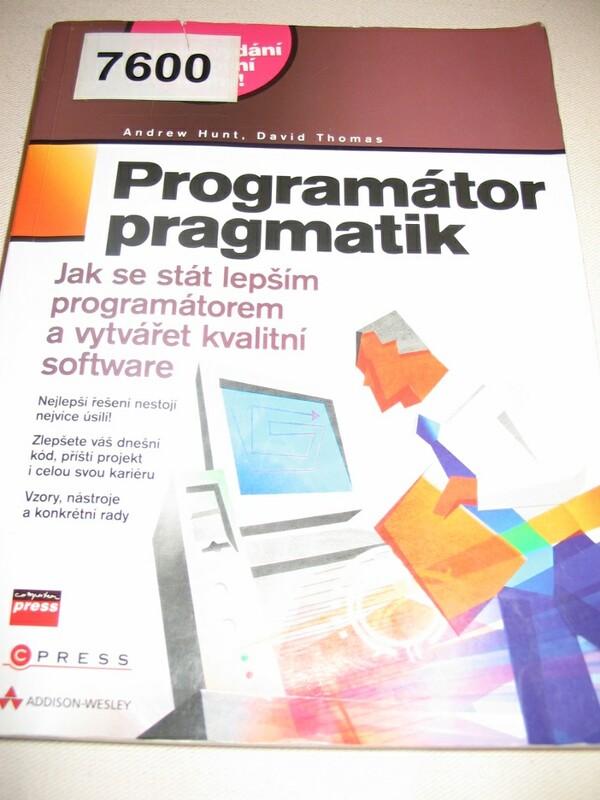 I’m talking about The Pragmatic Programmer by Andy Hunt and David Thomas. And yes, it’s gooood :)! Title of the book (in it’s Czech version) states: “How to become better programmer and create high quality software.” Right? I want that! It’s a sort-of-a compilation of advice on software development from the practical point of view based on the experience of the authors. A lot of books come with a load of theory which is good too, but when you’re digging through the mounds of formal methods, it’s very easy to forget about the practical side of software development. The very first chapter of talks about the career of a programmer or a software developer. The authors say to take your career choices as investments in your future. Pragmatic programmer should invest often and into a wide range of technologies. I don’t like the investment metaphor, but I like the thought. Computers train is moving fast and it will run you over at some point if you don’t jump in. What I liked about this book the most is the emphasis on automation of routine tasks through scripting and the DRY principle. Having good knowlege of the environment and tools you work with is the key in any profession. But programmers (including myself) often tend to focus on what are we doing and on the final results rather than how we do it. And frankly, every time I stop and think what I could do better or automatically, I always find some weak spot. 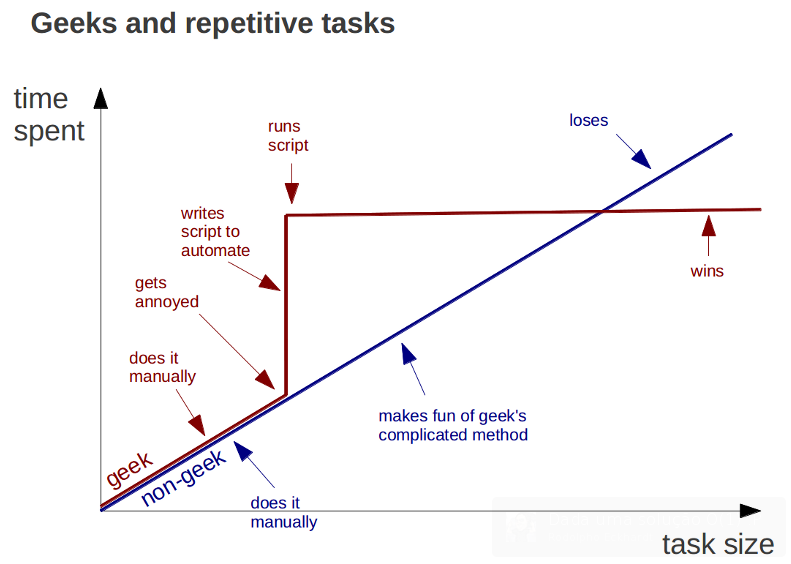 The process of programming as in actually writing the code should not be overseen as trivial. You can save yourself a lot of stress by being creative in this area. The DRY principle is somewhat connected to this. 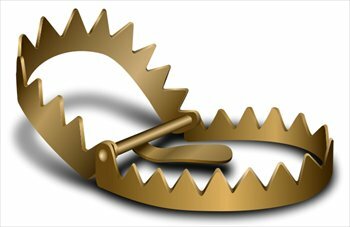 If you repeat yourself, you not only work ineffectively (you’re doing stuff twice), but you also set a trap for yourself, which you intend to step into later in the project. Overall the book is great and I definitely can recommend it. It’s something over 200 pages or so it shouldn’t take a year to read. It’s also very well written and full of jokes, which makes it fun to read! Throw exceptions at the right level of abstraction. This statement has a very interesting point. The errors that can occur in your code, regardless of whether it’s a exception thrown or a status code returned, should be at the same level of abstraction of the unit, class or even routine that they happen in. For example if function called downloadAndPrintReport() exits with MALLOC_FAILED. You see, this just isn’t right. The malloc failure is the cause of the problem, it’s not the problem itself and you (or the user) cannot react appropriately. I mean, which malloc() call failed? Does it mean the report wasn’t even downloaded or it was but wasn’t printed? What the hell is malloc anyway? User doesn’t know! Your error reports should be informative and useful to the receiver (which can be either a user or some parent code that deals with the error). By sticking to the current abstraction, your chances of delivering a good report rapidly grow. When downloadAndPrintReport() returns with UNABLE_TO_DOWNLOAD_REPORT, you can try to reopen the connection and try again later. In case of UNABLE_TO_PRINT_REPORT you can store it somewhere in a file instead of printing it. According to the Murphy’s law — “Anything that can go wrong will go wrong“. And if Mr. Murphy were also a software engineer, he would certainly add “and anything that cannot go wrong will go wrong as well“. Wise man that Murphy, but what does it mean for us, the programmers out there in the trenches? Error handling and reporting is a programming nightmare. It’s an extra work, it pollutes happy path of your code with whole bunch of weird if statements and forces you to return sets of mysterious error codes from functions. God, I hate error reporting (more than I hate New Jersey). It might not seem very important, but it’s crucial to set some error handling strategy and stick with it through the whole project. The error reporting code will be literally everywhere. If you choose poor strategy in the beginning, all of your code will be condemned to be ugly and inconsistent even before you start writing it. It’s inspired by GNU coreutils error reporting format. In the first section is always program name, so the user knows who is the message coming from. Second section says what happened or what did the error prevent to happen (e.g. “Cannot load configuration” or “Unable to establish remote connection”). Finally the last section informs user of what was the cause of his inconvenience, for instance “File ‘configuration.txt’ not found” or “Couldn’t resolve remote address”. This way gives the user complete insight in what happened, yet it won’t scare him off with too much of programming detail. In fact, revealing too much about your errors (stack traces, memory dumps etc.) might be potential security risk. Another criteria for evaluating error reporting strategy is how does it blend with the code. Generally, there are two approaches — centralized and decentralized error handling. Centralized way involves some sort of central database or storage of errors (usually a module or a header file) where are all the error messages stored. In code you pass an error code to some function and it does all the work for you. A big plus of this approach is that you have everything in one place. If you want to change something in error reporting you know exactly where to go. On the contrary, everything in your software will depend on this one component. When you decide to reuse some code, you’ll need to take the error handling code with it. Also, as your program will grow number of errors will grow as well, which can result in a huge pile of code in one place that will be very vulnerable to errors (since everyone will want to edit it to add his own errors). Decentralized approach to error reporting puts errors in places where they can happen. They’re part of interface of the respective modules. In C every module (sometimes even every function) would have it’s own set of error codes. 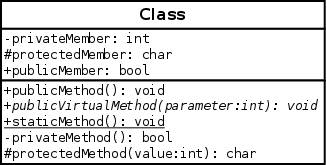 In C++ a class would have a set of exceptions associated with it. In my opinion, it’s a little harder to maintain and to keep consistent than the centralized way, but if you have the discipline to stick with it, it results in elegant and independent code. Somebody could say, that there will be a lot of duplicates of (let’s say) 5 most common errors, like IO failures and memory errors. Well, this is a problem of decentralized error reporting. You can minimize this by keeping your errors in context with the abstraction of the interface they fit in. For instance — class Socket will throw exceptions like ConnectionError or RecievingError not MallocError, FileError or even UnknownError. Malloc failure is the reason, which resulted in a problem with reading data, so from the point of Socket class it’s a reading error. These are the two basic ways of error handling. I will write separate posts about a few concrete common strategies, that I know and find useful or at least good to know (exceptions, error codes etc.). In the upcoming semester I’ll be taking class called Theoretical Computer Science. Which is said to be the hardest thing you can attend here at BUT. Only half the people pass the bar every year. It’s brutal. And since I’d really like to be a part of the lucky half, I thought I could dig into the theory a little earlier and see how bad it is. Computer science deals with the theoretical foundations of information, computation, and with practical techniques for their implementation and application. Computer scientists invent algorithmic processes that create, describe, and transform information and formulate suitable abstractions to model complex systems. Right, so we have information. How do people work with these anyway? People share their thoughts though languages. We talk and sometimes listen, we also read and sometimes write. Other people like to draw, play charades or sing. In all of these cases the information is encoded into some sort of language that others can understand. Sure, we’re people, it comes naturally to us, but what about the machines? A coffeemaker will most certainly not learn to talk to you or even understand your needs. Machines are dumb. That’s where we (the nerdy guys from engineering department) come in with formal languages — a substantial part of computer science. By formalizing common languages we make the machines understand our instructions. Ever heard of a programming language? Programming language is basically a sequence of instructions we use when we tell the computers what to do. It’s a language that we use when we talk to the computers. It sounds a little weird, but that’s it. Computer science sets up some ground rules so the computers can algorithmically analyze the instructions and process them. It explores possibilities of computers — what can be processed by a computer? Is there anything that computers can’t solve, why? Bunch of interesting stuff. Interesting, but sometimes very hard to understand. I wanted to put some basics here too, but I don’t want to scare you off too early. I got stuck for a while with the very basics at first (I figured it out eventually). The math will come in a stand-alone post shortly after. Stay tuned ;-). I got a copy of this awesome book today and I’m so excited, I have to write a post about it :-)! Yeah, dude, you got yourself a book, whatever. But it’s in English! 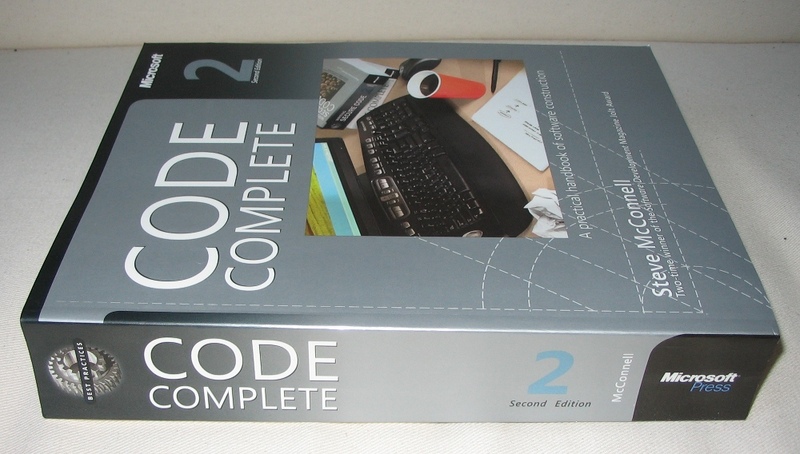 I read this holy bible of programming already. But it was only the crappy Czech translation, which is not only a lot worse, it’s actually more expensive than the original version. You got it! Microsoft Press. Who else could possibly screw up this otherwise perfect piece of literature? Even the Czech version comes in hardcover edition. Yeah, I’m kind of a Microsoft hater. Other than that the book is just amazing. 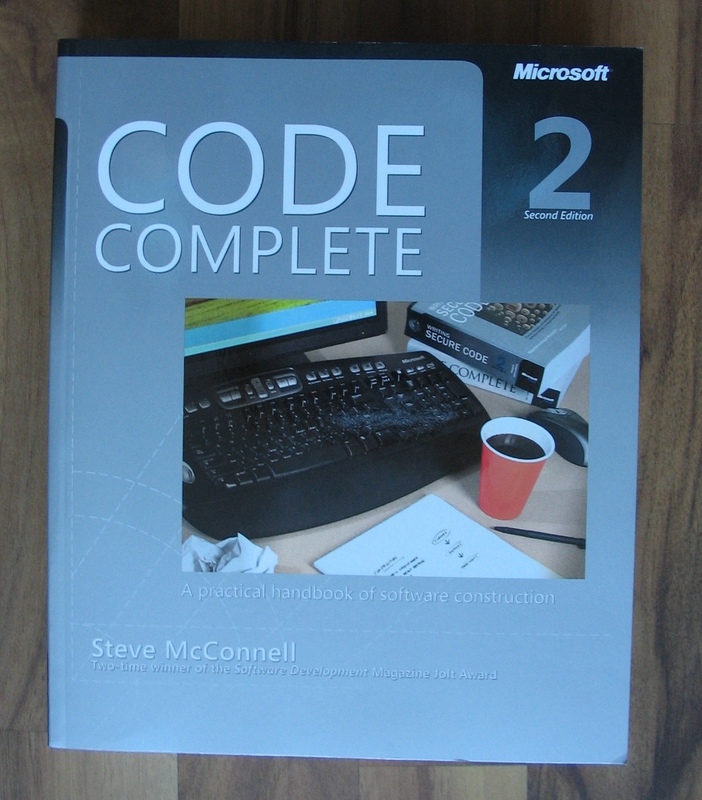 I recommend it to everyone who is serious about software development. Today I’m going to write some examples of Bridge. The design pattern not the game. Bridge is a structural pattern that decouples abstraction from the implementation of some component so the two can vary independently. The bridge pattern can also be thought of as two layers of abstraction. Bridge pattern is useful in times when you need to switch between multiple implementations at runtime. Another great case for using bridge is when you need to couple pool of interfaces with a pool of implementations (e.g. 5 different interfaces for different clients and 3 different implementations for different platforms). You need to make sure, that there’s a solution for every type of client on each platform. This could lead to very large number of classes in the inheritance hierarchy doing virtually the same thing. 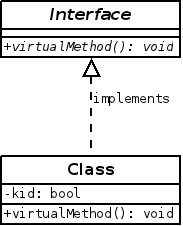 The implementation of the abstraction is moved one step back and hidden behind another interface. This allows you to outsource the implementation into another (orthogonal) inheritance hierarchy behind another interface. 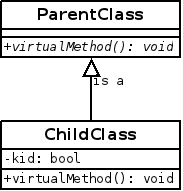 The original inheritance tree uses implementation through the bridge interface. Let’s have a look at diagram in Figure 1. As you can see, there are two orthogonal inheritance hierarchies. The first one is behind ImplementationInterface. 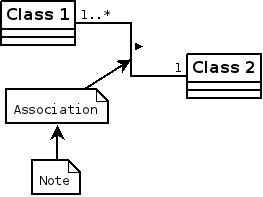 This implementation is injected using aggregation through Bridge class into the second hierarchy under the AbstractInterface. This allows having multiple cases coupled with multiple underlying implementations. The Client then uses objects through AbstractInterface. Let’s see it in code. Download complete source file from github. This is the target interface, that clients use.
""" Variant of the target interface. This is a variant of the target Abstract interface.
""" Interface for the background implementation. The Bridge pattern is very close to the Adapter by it’s structure, but there’s a huge difference in semantics. Bridge is designed up-front to let the abstraction and the implementation vary independently. Adapter is retrofitted to make unrelated classes work together . And back to design patterns! Today it’s time to start with structural patterns, since I have finished all the creational patterns. What are those structural patterns anyway? The first among the structural design patterns is Adapter. The name for it is totally appropriate, because it does exactly what any other real-life thing called adapter does. It converts some attribute of one device so it is usable together with another one. Most common adapters are between various types of electrical sockets. The adapters usually convert the voltage and/or the shape of the connector so you can plug-in different devices. The software adapters work exactly like the outlet adapters. Imagine having (possibly a third-party) class or module you need to use in your application. It’s poorly coded and it would pollute your nicely designed code. But there’s no other way, you need it’s functionality and don’t have time to write it from scratch. The best practice is to write your own adapter and wrap the old code inside of it. Then you can use your own interface and therefore reduce your dependence on the old ugly code. Especially, when the code comes from a third-party module you have no control on whatsoever. They could change something which would result in breaking your code on many places. That’s just unacceptable. 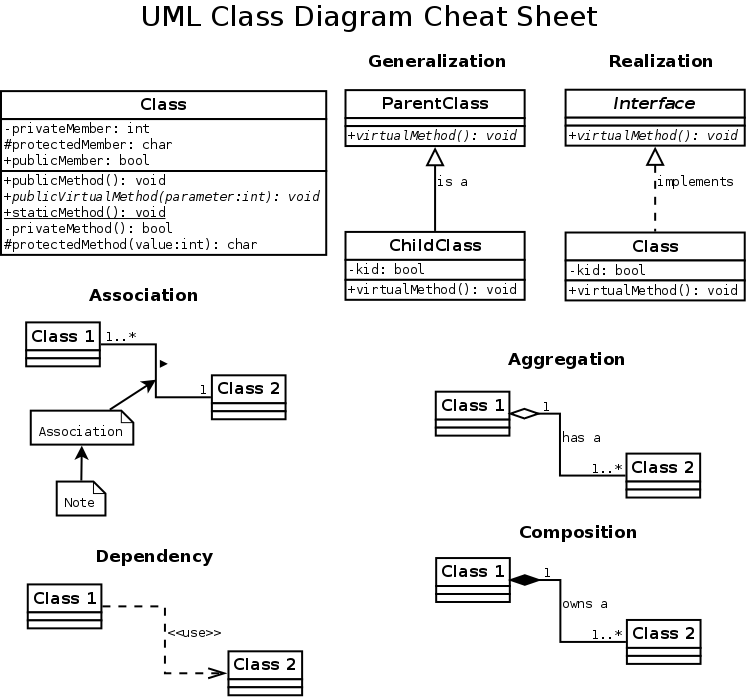 Here is an example class diagram of adapter use. You see there is some old interface which the adapter uses. On the other end, there is new target interface that the adapter implements. The client (i.e. your app) then uses the daisy fresh new interface. For more explanation see the source code examples bellow. The adapter uses the old rusty interface of a class or a module and maps it’s functionality to a new interface that is used by the clients. It’s kind of wrapper for the crappy code so it doesn’t get your code dirty.